Happy Saturday everyone. This is a very late post, but I want to share with you the cards I made today. I spent part of my day doing laundry, cooking and cleaning. David did a lot of outside work, GO DAVID!!!! poor hubby, he was so tired and his face looked so sun burned, after finishing his hard work, he spent time watching a movie and playing with Rebecca. He is so cool!!!! Anyway, back to my cards. I created 4 cards, I think they are really cute, LOL. Yesterday I got some Suzy's Zoo images from the WR group and I wanted to use them for these cards. 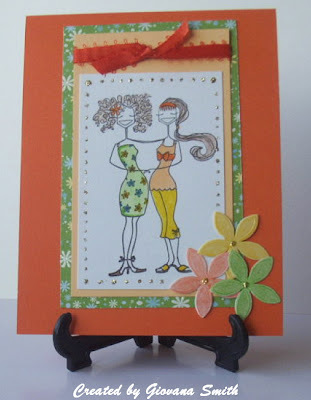 I also made a card for Beate's Weekend Sketch Challenge. 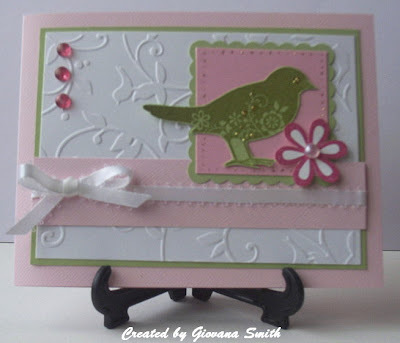 Card stock: White (GP), SU Pretty in Pink, Light Yellow, Bazzill Pink. 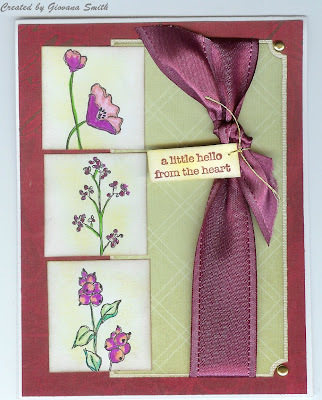 Embellishments: SU Pretty in Pink ribbon, SU Bashful Blue Ribbon, gold stickles. Accessories: Coluzzle, Scallop scissors, SU dimensionals, mini glue dots, double sided tape. 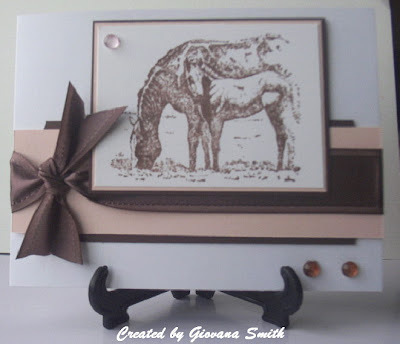 Card Stock: SU Creamy Caramel, Black, White (GP), Red. Ink: Black. Green and light blue pigment inks, Sargent Art colored pencils. 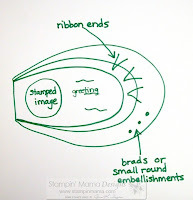 Embellishments: American Craft Ribbon, gold stickles. Accessories: Coluzzle, double sided tape. 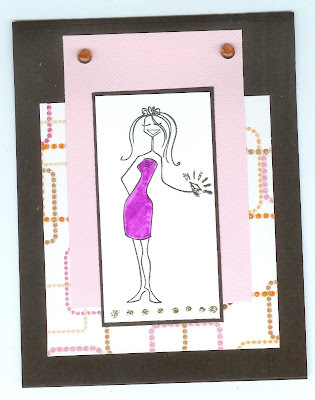 Card stock: SU Pretty in Pink, SU Certainly Celery, White (GP), Bazzill Pink. Ink: SU Certainly Celery, SU Red Rose. Embellishments: Bella baubles, White ribbon, gold stickles. Accessories: SU dimensionals, Mini glue dots, Bella baubles, double sided tape. Happy Friday everyone!!!! I hope you are having a great day. This morning I tried the Limited Supplied Challenge, I had an idea of what I wanted to create, but when I was working on my card, this didn't come out the way it was on my brain, LOL. 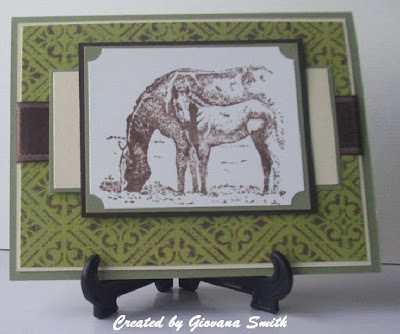 I didn't embossed the image, I used Chocolate Chip Craft ink and I added a bella bubble in the middle, just for the little touch. 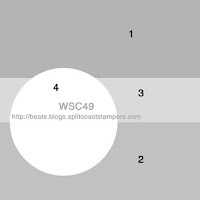 Card stock: Brown, White (GP), SU Close to cocoa. Ink: SU Chocolate chip craft ink. Embellishments: SU chocolate chip Satin ribbon, Bella baubles. Accessories: Double sided tape, SU Mini glue dots. Happy Thursday everyone, today we have a beautiful day, sunny, clear and not to hot!!!! (that is the best part). I don't like hot days, I prefer breeze and cool days, LOL. Rebecca is waiting for the hot days so we can enjoy the pool, well I would say mommy and daddy because for her the water is always cold, LOL. 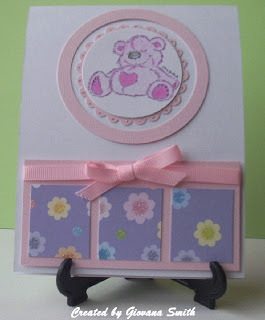 Here is my card: I used Sponging technique. Stamp: SU Summer by the Sea. 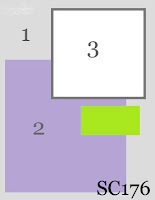 Card Stock: White (GP), Blue, SU Bashful blue, SU Groovy Guava. Ink: Orange, Yellow, Silver pigments, SU Bashful Blue, SU Buckaroo blue. Embellishments: Bella baubles, gold stickles. Accessories: punch corner, double sided tape, mini glue dots. My good friend and sister in Christ Diane is offering a great blog candy, celebrating her 15,000 hits, go and give her some love. Hi again, I had some time to create another card when Becca was taking a nap. 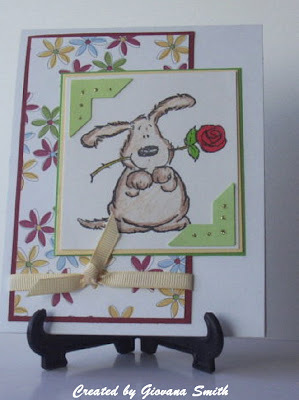 I made this card for May Card Contest on the Wish Rak Group. I used Sketch #143 (SCS). This time I used oval punches and no stamps!!!! I followed Michelle Zindorf's tutorial . You should give it a try, it is a really fun technique. I don't own any flower punch, so I used Bride' flowers from Michael's and the little green Prima flowers. I colored the bride flowers using Yellow pigment. Card stock: Green (non SU), Su Green Galore, Su Only Orange, SU Yo Yo Yellow, White (GP). Ink: Yellow, Orange, Silver, Chocolate chip pigments. Embellishments: SU ribbon, Bella baubles, Bride flowers, Prima flowers. Accessories: SU dimensionals, double sided tape, SU mini glue dots, gold stickles. Happy Wednesday everyone. Today I have a lot of yard work to do, I started last night and I am feeling a little bit tired already, but DH and I are cleaning the biggest part of our property that has lots of weeds, I hate weeds. We are dreaming one day we will have the most beautiful yard and why not a perfect garden too!!!! Anyway, today on SCS is Sketch Challenge Day . I would say I tried the sketch with a completely different set and colors, but at the end I didn't like the results, so I tried again and I love this card. I hope you too. I received this pretty image from the WR group , this is from SU Heartspeak set. I colored the basket using Sargent Art Colored Pencils, I used Tan, Orange and Brown. the flowers are colors with Red Orange, Red, Rose,Peach, Yellow and Pink, after that I over colored them with SU markers. The leaves are colored with Yellow Green. I sponged the middle are and the diamond white CS with Orange pigment ink. I added a couple of Bella Baubles in the right bottom corner. The orange ribbon is from Walmart. Happy Tuesday everyone. I hope you had a great Memorial Day. We enjoyed the day and had a great BBQ. My husband is a veteran and this occasion are very especial for him. He prepared the best BBQ ever!!! I would day that most of time I do the job, but this time he made everything!!!!! Rebecca enjoyed being outside helping daddy, but after a while she decided she was to tired and wanted a nap, LOL. 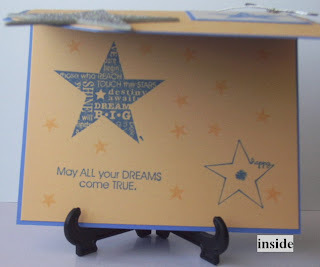 I enjoyed my afternoon stamping without interruptions, oh what a lovely day. 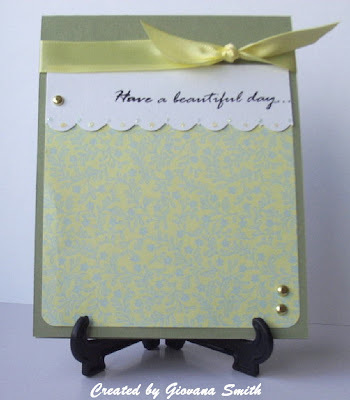 Anyway, today is Color combination challenge on SCS, really pretty colors: Chocolate Chip, Sage Shadow and Very Vanilla..
Card stock: Chocolate chip, Sage shadow, very vanilla and white. Embellishments: SU Chocolate chip satin ribbon. 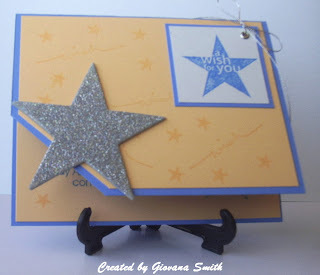 Happy Sunday everyone, today I want to share with the cards I made with the items I received through the Wish Rak group. I cased this card . I received the image through the WR group. I received the image and photo corner punches through the WR group. Image and ribbon received throught he WR group. WRMDCC04: Fun in the Sun. Image and embossed CS and Circle punch received throug the WR group. Image and BG received through the WR group. 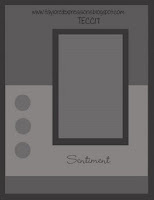 Image and sentiment received through the WR group. WRMDCC07: Christmas Cards for the troops. Image received through the WR group. 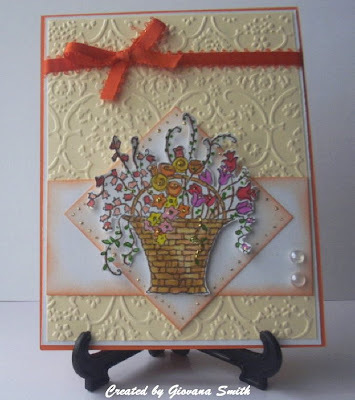 Image, Cuttlebug embossed CS and Prima flowers received through the group. Edited to add: I just added my last 4 cards. I want to say that I enjoyed all the challenges very much!! Thanks Wish Rak group. Hello everyone, today here is cold as a winter day (crazy weather), my allergies and sinus pressure are bothering me again. Early in the morning I didn't have any mojo to stamp. I spent my morning cleaning my house and homeschooling Rebecca, she is doing so great, few more days and school is over, I have to think of something to keep her busy, well, she keeps me busy all day, LOL. Few weeks ago my uncle had a heart bypass surgery, he is doing better now, my cousins are taking care of their dad. My aunt had a surgery last week; both are my mom's siblings; I love them very much and you don't know how much I miss them. This morning I spent time praying for them, my siblings, my dad, I wish I could be there and hug them all day. Last time I went to Peru, Rebecca was only 9 month-old baby, now she is 4!!! 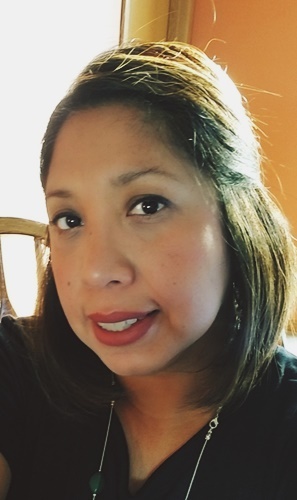 Now she is more into speaking Spanish, she is so funny, she repeats everything I say, well sometimes her way and with a very heavy accent, but she wants to learn more Spanish now, so I am taking advantage of that. This afternoon (when Becca's was taking a nap) I tried a couple of Sketch Challenges: Beate's and Taylor's. I always try to play their challenges, they are so talented. 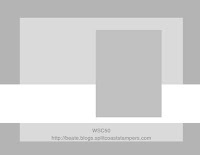 Card stock: Black, White, Barely Banana, Bashful Blue, Sage Shadow. Ink: Stazon black, SU Mellow Moss, orange and yellow pigment. Embellishments: Yellow ribbon, light blue ribbon, Bella's baubles. Accessories: SU dimensionals, double sided tape, mini glue dots. Hello everyone, I hope you are having a great!!!! I have 4 cards to share with you today. 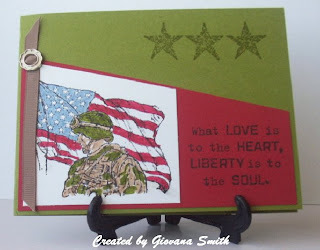 Two cards I made last night at my Stamping Party and 2 I made today for Gina K Challenge. 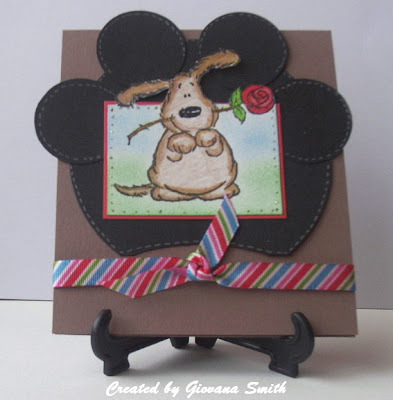 Today on SCS is another challenge day "Masculine Cards", Last night I made 2 cards and they are perfect masculine ones. Stamp: SU The Fre & The Brave. Ink: Old Olive, Basic Black. Accessories: SU Markers, Ribbon, Silver Hodgepodge Hardware. 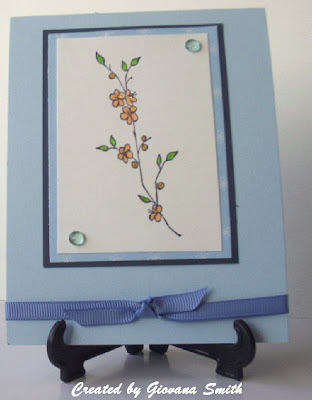 Card Stock: Ballet Blue, Apricot Appeal, Natural White. Ink: Ballet Blue, Apricot Appeal, Bashful Blue, Craft Whisper White. Accessories: Glitter Dazzling Diamonds, Heat & Stick Powder. Last Tuesday Gina K had a great party on SCS, new releases and also new challenges!!! They are 3 challenges, but I just made 2, I hope later I can finish the 3rd one. I used oval punches and I created a flower, (I made something similar before) I stamped a bee and a butterfly and cut them out and added onto my flower using mini glue dots. 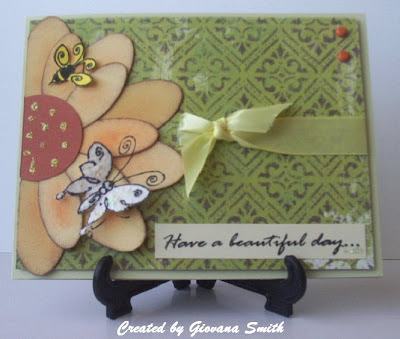 The butterfly is stamped in handmade paper that gives it a really nice textured. I added some glitter. 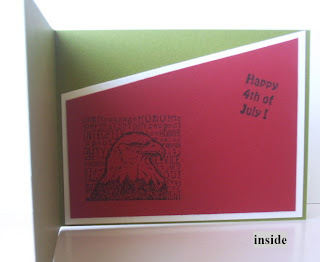 Card Stock: Green, Cream, Rusty Red. Stamps: Sea Life H&M Stamps (sentiment), SU Merci. Accessories: SU Dimensionals, glitter, double sided tape. 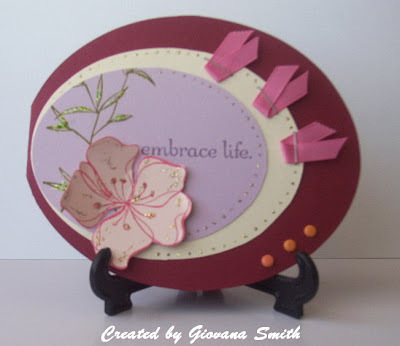 Ericka Martin also created a pretty sketch, first time I made an oval card and I really really like the idea. Hello everyone, today is a really nice day here in the NW. Maybe I will go outside and do some light work on my yard. Today on SCS is Sketch Challenge Day, pretty good sketch. 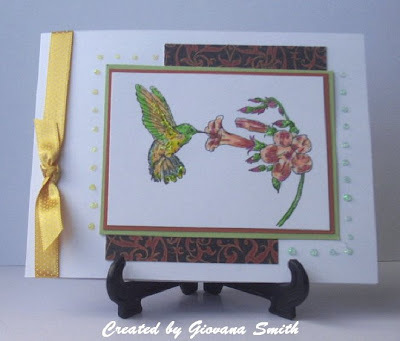 I used an image I received through the Wish Rak group, the pretty hummingbird from Spring Song Set. I colored the image using colored pencils and markers. I added some American Craft ribbon at the top (I realized after trimming my image it was too small , oopps). I put some dot glitter around the image. Card stock: White (GP), SU Really Rusty, SU Old Olive. Embellishments: Yellow Polka Ribbon (American Crafts). Accessories: Yellow and green glitter glue, double sided tape. Hi, I am back with a couple of cards that I made using some "forgotten paper" that I had there. I love to buy paper and then I don't use it, I hope I am not the only one with that problem. Who motivated me to do this??? ?, Well, yesterday searching the web I found this blog. 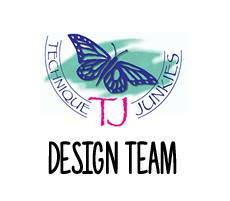 She (Tomiannie) has a great blog and also a challenge using paper or anything you have there and never have used. So I close my eyes and I took a couple of papers, they both are similar, LOL, anyway, with the paper on hand I decided to work on my cards. I just wanted to create something simple and elegant at the same time. 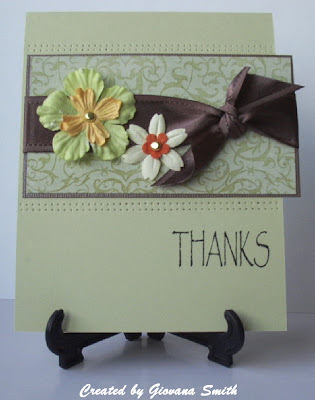 For both of my cards I used the sentiments from Sea Life Set H&MStamps . My second card is a case from Dawn. She has an awesome blog, go check it out!!! 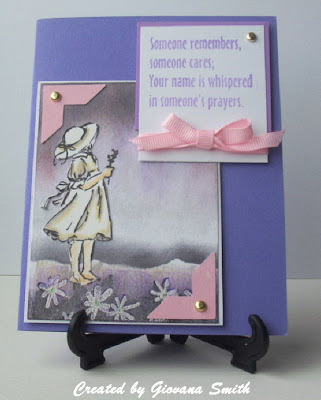 She was the Featured Stamper last Sunday. Card stock: SU River Rock, Brown Bazzill. 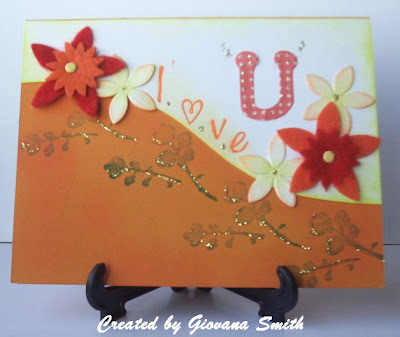 Embellishments: Prima flowers, SU Chocolate Chip Sattin Ribbon, gold brads. Accessories: Punch corner, double sided tape. Hello everyone, I hope you all are doing great. Here the weather is great, well for me, I don't tolerate the heat really well, today we have 68 F, rainy and fresh, oh outside smells so good, 68 is a lot better than 100F, right? We had a very hot weekend, I didn't enjoy that much. Anyway, today is another challenge day on SCS: Color combination challenge. Colors for today are: soft sky (bashful blue), blue bayou (night of navy) and certainly celery. 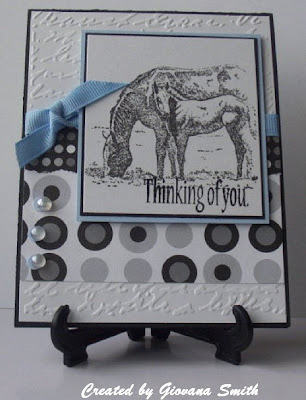 I used for my card Blue bayou, Bashful blue (DP Cutie Pie) and Certainly celery. 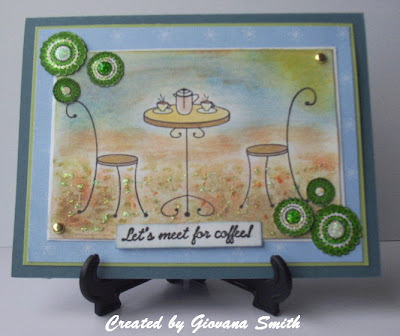 I used the image from Gina K. Designs "Thinking of You" I cut the topiary and added in the corners, I colored them green using SU markers. The background is color with different tones of pigment inks (yellow, orange and light blue) I used watercolor crayons too. I used Kazan Clark sketch, she has an awesome blog and also a great give away too, go check it out . 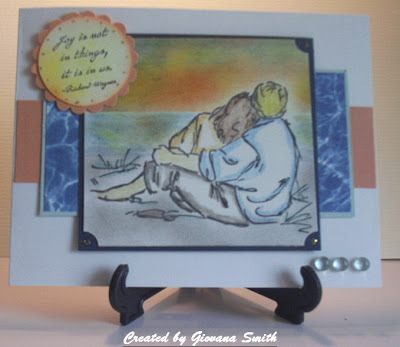 Stamp: Thinking of you by Gina K.
Ink: Yellow, Orange, Light blue pigments. SU Mellow Moss. I just found this blog!!!! 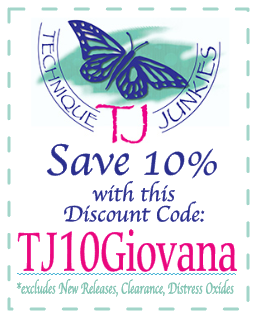 and also she is giving away an awesome blog candy, more than $40 in products. Heather is having a great blog candy; celebrating her blogaversary + 13,000 hits!!!! please check her blog!!!! 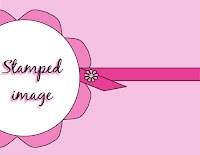 She is the proud owner of H&MStamps, with awesome stamps and new releases coming on this 25th. Heidi at Heidi's Papir Verden is offering a great blog candy, go and check it out!!! 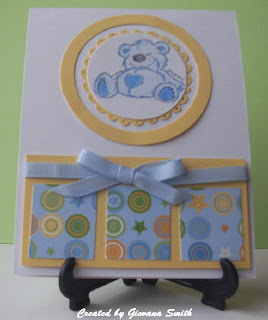 Michelle O at Stamps, paper, Scissors and Donkey Smiles is giving away a great blog candy celebrating her 5,000 hits!!! Another Cupcake Challenge, this time I didn't use a cupcake image, I tried something more Patriotic. I used this image from the new SU set "The Free and the Brave" (I got the images through the Wish Rak group). I colored the image (only the flag) with SU markers. 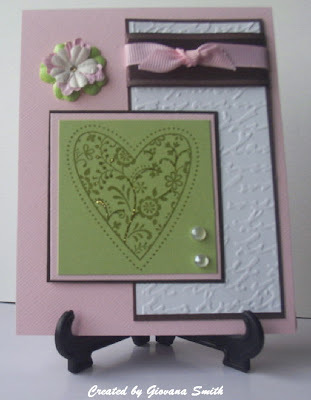 My finished card is 5" square. I followed Taylor's sketch, you can see all the details here . Card Stock: Blue, Burgundy, White. 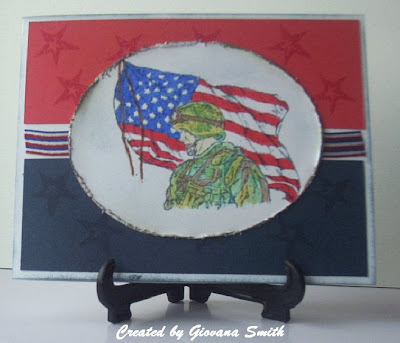 Stamps: SU The Free and the brave, Stars by Autumn Leaves Clear Stamps. 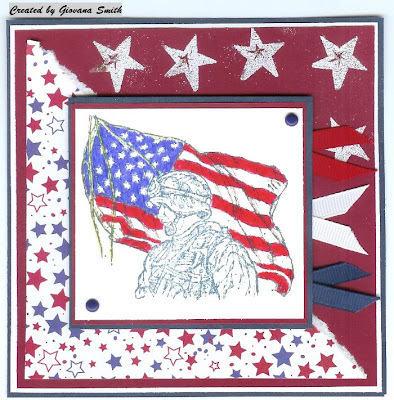 Embellishments: Blue brads, red, white and blue ribbon. 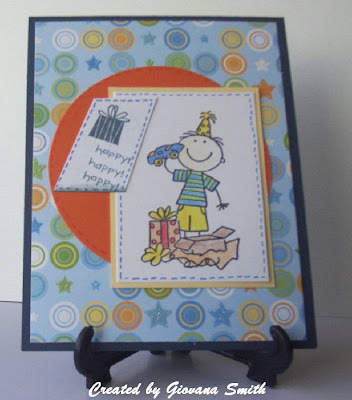 Accessories: SU dimensionals, SU markers, embossing gun, double sided tape. Happy Sunday everyone. Las Tuesday, my good friend had her baby girl, I met her today at church, she is so cute!!!!!! She slept the whole service and she was just fine with all the noise after it. Just when almost everybody was gone she was a little fuzzy, of course, she was hungry!!! My Rebecca was so excited to see her, she has been waiting all this time to meet her. I made a card for her. I was not sure if Heidi would be at church today, I am planning to go to her house and bring it tomorrow with something else I made for baby lily too. For my card I used the cute dolphin from Sea life set (H&M Stamps). 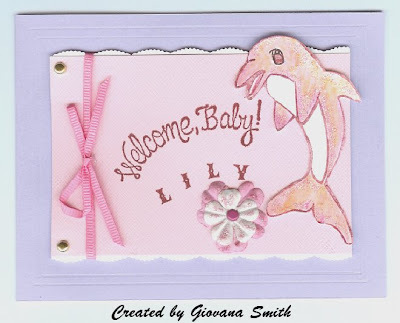 Stamps: Dolphin (H&M Stamps), Welcome Baby (Inky Antics), Alphabet by Studio G.
Embellishments: Pink ribbon, gold brads, pink brad, Prima flowers. Accessories: SU dimensionals, scallop scissors, double sided tape. 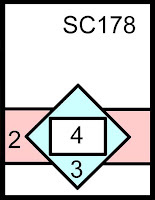 I created this card for Card Positioning Systems. 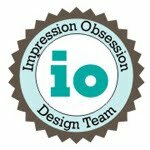 I tried every week to create a card for this blog challenge, but I couldn't until today. 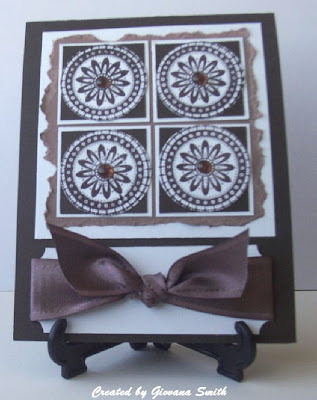 I used Baroque Motifs images for my card. Card Stock: White (GP), Burgundy and SU Brocade Blue. Ink: SU Rose Red, SU Brocade Blue. Embellishments: SU Purely pomegranate Satin Ribbon, gold brad, gold stickles. Accessories: double sided tape, mini glue dots, SU corner rounder punch. Hello everyone, I hope you had a great day (here is 7:35 pm), usually at this time I am relaxing myself after being busy all day. Today I spent part of my morning watering my plants and relaxing outside until I couldn't deal with the heat, so I decided to go back inside and tried a couple of cards. DH was mowing the lawn and poor guy came back so reddd, LOL, cooking himself direct to the cold water. Anyway, today I tried Limited Supplies Challenge, using an alphabet as a main focus on the card. 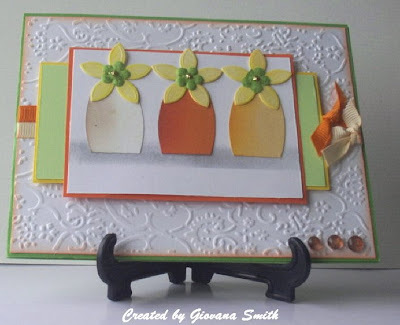 I sponged the orange and white CS with orange and yellow pigment, I stamped some flowers using green pigment around the borders. I sponged as well some bride flowers from Michael's with yellow and orange ink. The felt flowers are my creation, I cut them myself, pretty ha? Stamps: In the Loop Alphabet (SU), A Real Bluebonnet (Hero Arts). Ink: Orange, Yellow and Green pigment. Embellishments: felt flowers, bride flowers (Michael's), yellow brads, gold stickles. Accessories: Scissors, double sided tape, mini glue dots, sponge. Hello everyone, Happy Thursday!!! Another day and another reason to celebrate life. I am feeling a little bit better today, I slept better last night than nightbefore. Still taking my medication, helps me to feel better, but takes all my energy, ohhh well, I haven't had any serious chest pain in the last two days, that is good. 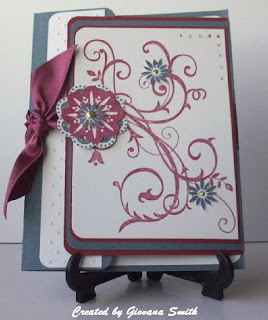 Today my inspiration still blocked, I haven't created anything singular, so I cased Debbie Olson's card, I love Debbie and all of her creation, she has been so great with me. My little squares are 1.5", I hope its qualifies for the challenge. I colored my images (Thanks Bethany, I received them through he Wish Rak group) with colored Pencils and then added some SU markers. 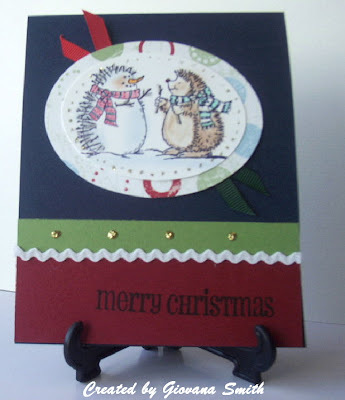 I sponged the borders with gold and cranberry crisp ink and the image with some yellow pigment ink. I stamped the sentiment in cranberry crisp. Stamps: SU Oh So lovely (hostess), SU Vases in Vogue (hostess). Ink: Black, Yellow and gold pigment, SU Cranberry Crisp. Embellishments: Gold brads, gold thread, SU Purely pomegranate Satin Ribbon. Accessories: Colored pencils, SU Markers, double sided tape, Punch border. Hello everyone. I hope you are having a great day, better than me. I woke up at 2 am with a terrible headache, palpitations, I tried to go back to sleep, but my headache was getting worse, finally I got up, took an aspirin and I decided to watch TV. DH woke up at 5:30 and I heard he was looking for me, he went to the living room and asked me if I was OK, I said I feel better now, he wanted to stay home today, I told him I will call you if I need you, right now I am feeling super tired, I really want to go back to sleep, but I don't have anybody to watch Rebecca, so I suppose I will sleep when she takes her nap. Thanks a lot all of you who sent me e-mails, I appreciate your words and prayers. 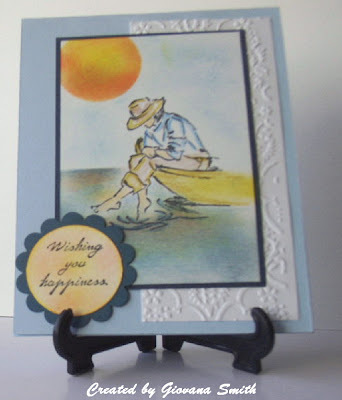 Stamps: SU Summer by the Sea, Daisy Trio #1 by smARTworks. Ink: Lavender, Gray, Black, Gold. 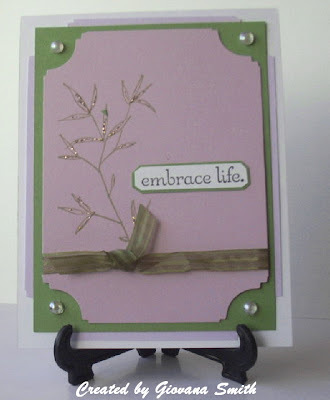 Embellishments: gold brads,Su Pretty in Pink ribbon. 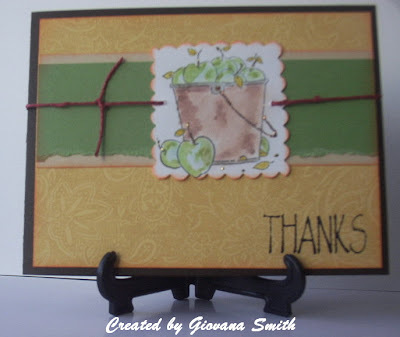 Accessories: photo corners, SU dimensionals, double sided tape. A Friend... the most precious.